Alsatian tarts are delicious, and the region is famous for tarte à l'oignan. The Alsatian tarte à l'oignan, or onion tart, is found on many restaurant menus in Strasbourg, Colmar, and other parts of Alsace. 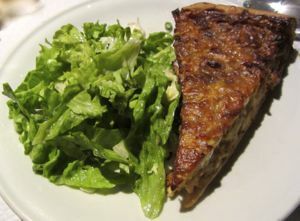 Similar to a quiche, the tarte à l'oignan is made with eggs, milk or cream, and onions. It may also contain bacon. It's often served as an entrée, or first course or starter, usually accompanied by salad. Although onion tart is the traditional tart of Alsace, you may also find other varieties depending on the season—asparagus in the spring, mushrooms in the fall, etc. And don't confuse these egg and cream based tarts with tarte flambée, another Alsatian specialty that might be thought of as a cousin to a pizza. They're very different, and both merit sampling in Alsace. What to drink with a tarte à l'oignan? I enjoyed a nice Riesling wine with mine, one of the excellent Alsatian wines. Above, Tarte à l'Oignan, served with salad as a starter in a Strasbourg restaurant.